don't you ahte it when you get spam as blog comments?? Glad we found your blog- now we can keep up w/ you guys and your DESSERTS!!! They look fab! 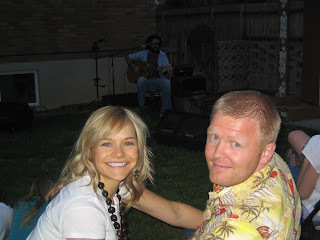 Sorry we missed the big luau- we were on diaper duty that night..and the night after and the night after..haha Looked like lots of fun, maybe next year! By the way, we made that pulled pork the other night when we had family over, and it turned out awesome. So, thanks for the recipe! I found your blog via facebook :) You guys are so cute and we love to find new blogging buddies. Thanks again for inviting us to your Kalai night we had so much fun and totally blogged about it! Hey! I found you guys! Looks like things are going well for you down in Salt Lake. My brother in law got booted the other day, and I thought of you Quinn. If only all booters could die! We're still sad we missed the party! Sounds (and looks) like it was a blast! Hey you two...we stumbled on your blog through Mackenzie Wilson's. I hope things are going well. Let's try getting together this summer. Wow, awesome party! Life in Brazil is going great! Keep in touch! QUINN!!!! not sure if you remember me but i was roommates with Tabitha?? I saw you had a blog and thought i would say hi! let me know whats up! Hey Millets! Time to update the blog. I am tagging you, so go to our blog, and then do it on yours. Cool? Plus, we need to hang out. I guess we have the Jack Johnson concert coming up pretty soon, but I am sure we can get together before that right?